A. A. Naumov. Alexander Pushkin's duel with Georges d’Anthès. The great poet’s death has taken on an almost mythical status in Russian culture. On its 180th anniversary, RBTH presents five interesting facts about this seminal event in Russian literary history. Most Russians will tell you that their favorite fruit is an apple and their favorite poet is Pushkin. To a man or woman they know that the country’s most beloved poet and father of modern Russian literary language died a painful death after a duel, forgiving everyone who had wronged him. As with so many duels, the cause of the disagreement was a woman. Pushkin was an impulsive man and fought many duels. Indeed, his fatal duel was the second time he had challenged Georges d’Anthès, a French officer in the Russian Guard, for besmirching his honor. The first occasion was in November 1836, when he received an anonymous pasquinade called “Certificate of a Cuckold”, which contained a clear allusion to his wife Natalya Goncharova's infidelity. There were rumors in St. Petersburg that Tsar Nicholas I held a candle for Goncharova, but clearly Pushkin could not challenge the country’s supreme ruler, so he chose the second possible option as he saw it: d’Anthès. However, the Frenchman soon proposed to Ekaterina Goncharova, the sister of Pushkin’s wife, leading the poet to rescind his challenge. Rumors began circulating again after the wedding, and the poet, thinking – as he had with the first letter – that their source was Baron van Heeckeren, the Dutch Ambassador to Russia and d’Anthès’ adopted father, wrote him a caustic letter. The unflattering comments Pushkin made towards both the ambassador and his adopted son caused Heeckeren to announce that the original challenge was still valid. The duel took place at Chernaya Rechka on the outskirts of St. Petersburg and had extremely harsh terms. In other European countries duelists usually shot at each other at a distance of 25-30 steps, but in this case the distance was set at just 10 steps. D’Anthès fired first and badly wounded Pushkin in the stomach. Pushkin fell to the ground but was able to fire at his opponent, grazing d’Anthès’ right hand. The poet died two days later. Duels in Russia had been prohibited by Peter the Great and so took place in secret. The punishment for taking part in them severe, sometimes even death. 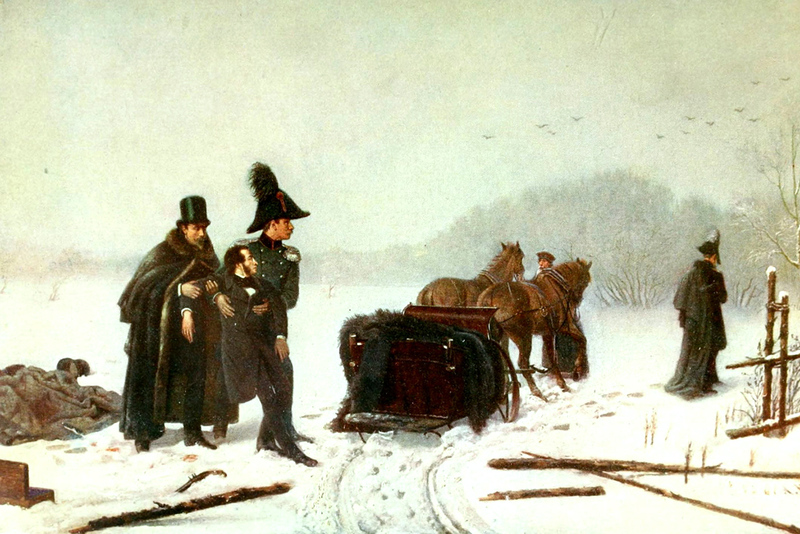 As he lay dying, Pushkin managed to obtain Nicholas I's forgiveness for his second, Konstantin Danzas, through the tsar’s doctor. Danzas was imprisoned in the Peter and Paul Fortress for two months. Nicholas provided for the dead poet’s family: he paid off Pushkin's debts, ordered that the family be paid a lump-sum grant of 10,000 rubles, gave a pension to the widow and her daughters and took in the poet’s sons as pages. The tsar stripped d’Anthès of his military title and exiled him from Russia. He was accompanied by his wife, Pushkin’s sister-in-law, and the couple went on to have four children. According to a contemporary, he used to say that being exiled from Russia enabled him to have a “brilliant political career” back in France. Following World War II two of D’Anthès’ letters from 1836 were published in Paris. In them he describes his infatuation with “the most wonderful creation in St. Petersburg”, writing that she feels the same way about him and that her husband is “furiously jealous”. However, the letters also say that she is not ready “to break her commitment” to her husband. There is no consensus on these letters. Some researchers believe that d’Anthès is not writing about Goncharova, while others feel that he was just trying to dispel rumors about his alleged sexual relationship with Baron van Heeckeren. Pushkin is thought to have made more than 20 challenges to duels – receiving seven himself. Four of these resulted in duels, while the others were largely avoided thanks to the poet’s friends. Pushkin was just 17 when he made his first challenge. He was offended that his uncle, Pavel Gannibal, stole the girl he was dancing with at a ball. However, the men quickly made up and the duel didn’t take place. Pushkin was renowned as an expert marksman, but he never shot first in duels and only shed his opponent’s blood once: in his final showdown with d’Anthès.